Attractive 3-5" lacy umbels atop strong, sturdy, upright stems. Flowers in shades of dark purple, pink, or white. Highly productive with 7-15 stems per plant. Long-lasting in bouquets. Also known as Queen Anne's lace, ornamental carrot, and wild carrot. 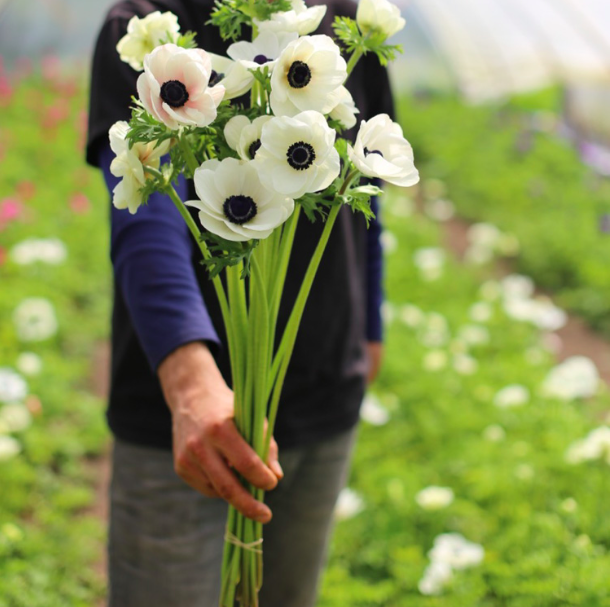 One of the most eye-catching and productive spring bloomers, anemones have been a favorite with our customers for many years. Flowering just three months after planting, these easy to grow bulbs bloom abundantly throughout the spring, often producing up to 20 flowers per bulb, making them a true garden workhorse. Also a favorite with floral designers and brides. Sweetly aromatic everlasting. Tall plants have fern-like, dark green foliage dotted with tiny cream-yellow colored flowers. Use foliage for wreaths and as filler for mixed bouquets. Also known as sweet sagewort, sweet woodworm, and Chinese woodworm. Organically grown. Ht. 48-72"
The tallest cut-flower basil in our trials. Aromatto has sturdy, purple stems, dark purple flower bracts, and purple-green bicolor foliage. Use as a filler accent or edible flower. Scent is similar to Cinnamon basil.